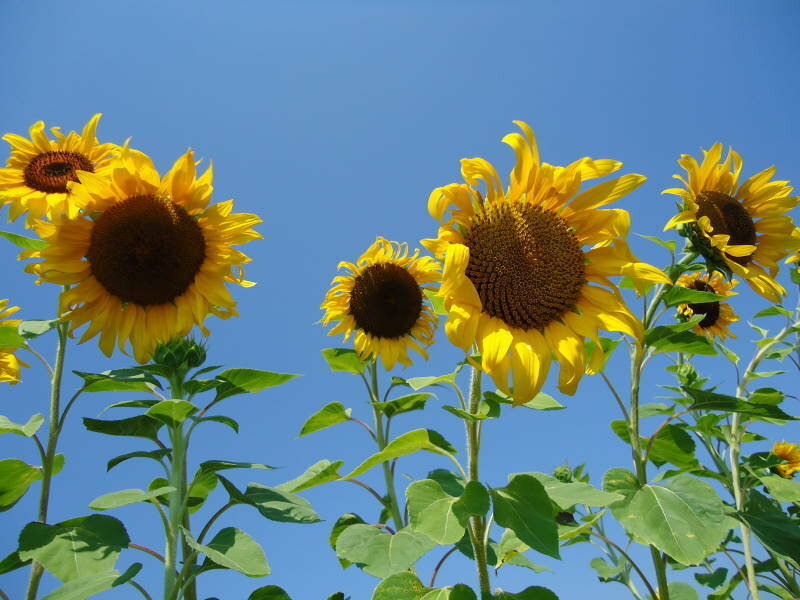 I've always been fascinated by the sunflowers - by their beauty and by the way they turn their heads towards the sun. 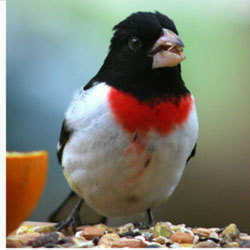 Moreover, I am addicted to their seeds, yet I don't mind sharing it with the birds living in my yard. Does this sound like I have a hidden agenda? You might be surprised! Romanians like to eat sunflower seeds, same as Americans like to eat popcorn. 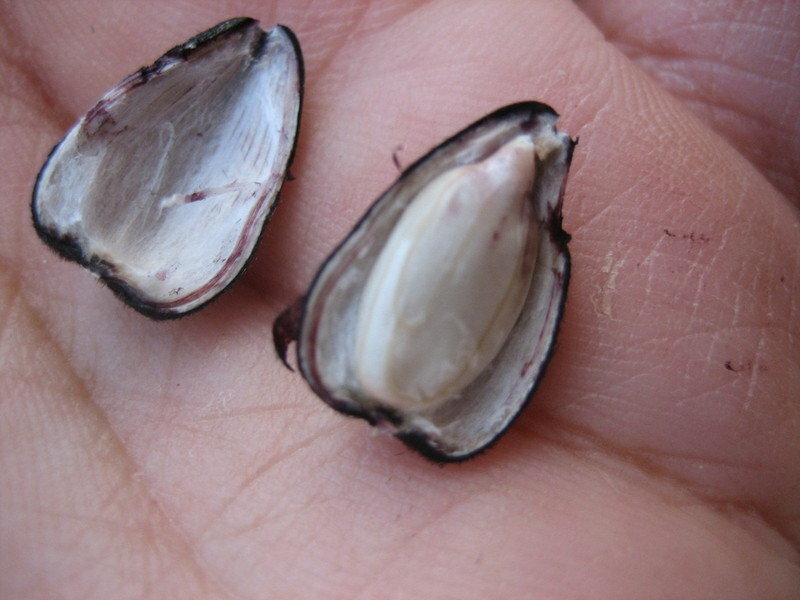 We particularly like to eat them by cracking the shells (the dehulled kernels from the store don't have fun! ), while watching a game (in the stadium, if possible) or while watching a movie. It is a good remedy against stress and sometimes can even replace smoking. 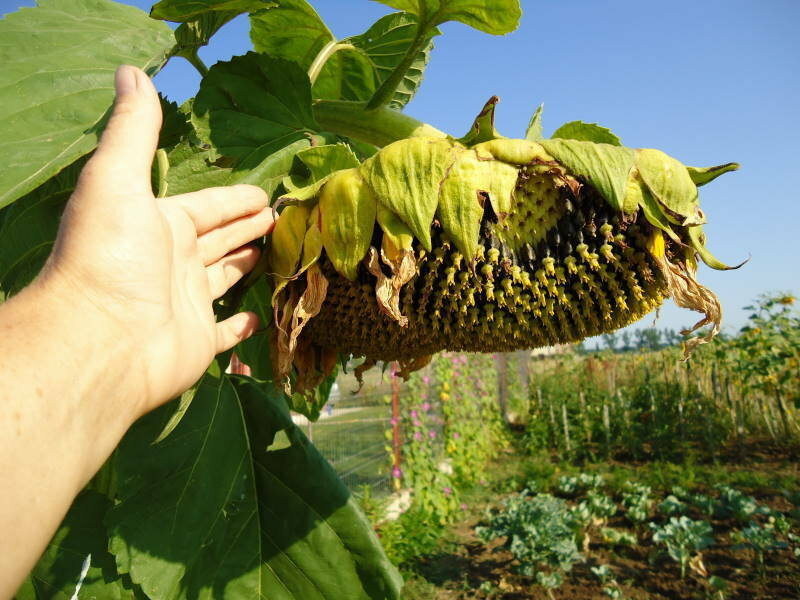 I've always enjoyed eating sunflower seeds, but I rarely had the opportunity to see a real sunflower head - or hat, as we call them in Romania - before I had my own garden and could sow sunflower seeds. Many years ago, I was lucky to see how the ripe sunflower seeds were scattered out from their hats, at one of our relative's house, in the countryside. 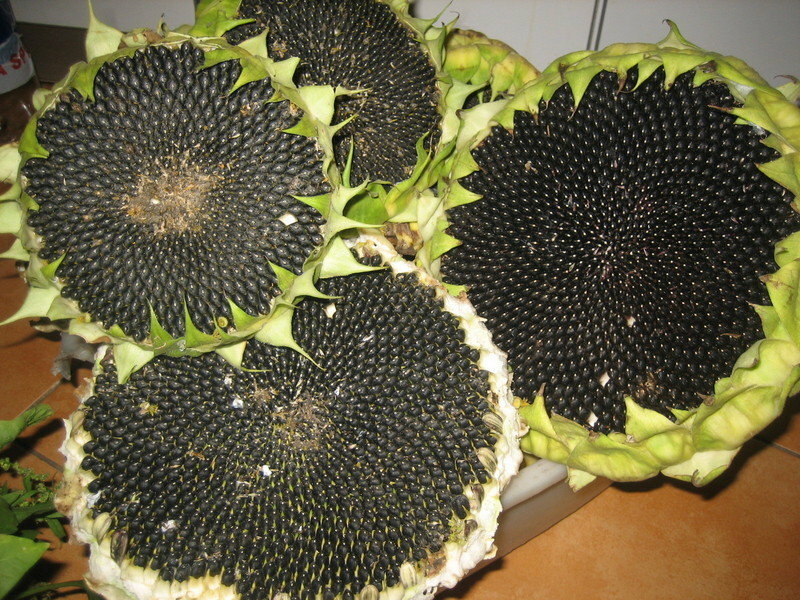 It was harvest time and they brought the sunflower heads from the field, while I was there. 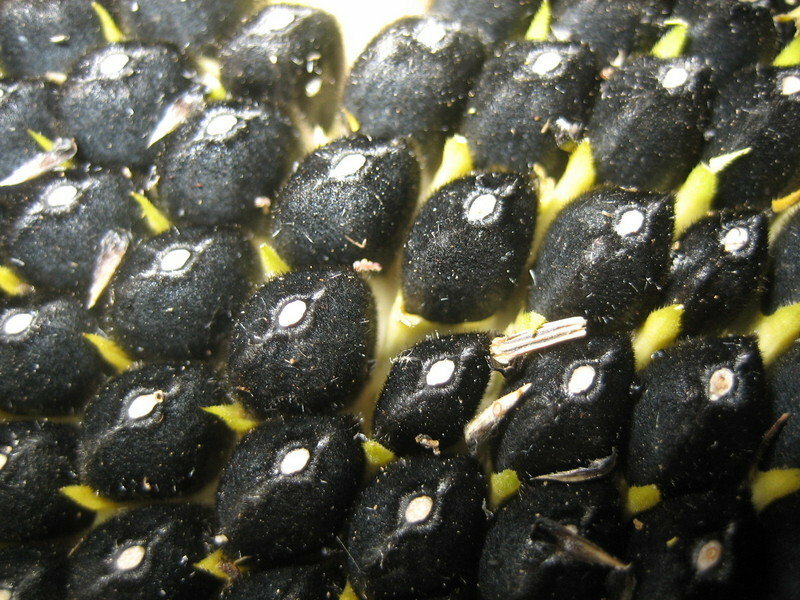 They dropped them in the yard, arranging them in huge piles, according to the seeds' size. They gave each of us a stick and showed us how to hit the back of the sunflower hat to make the seeds fall out, on some large cloths, laid down on the ground. It was a wonderful, exciting experience for me, as a city girl, and I remembered it the first time I ever harvested a sunflower hat from my own garden. 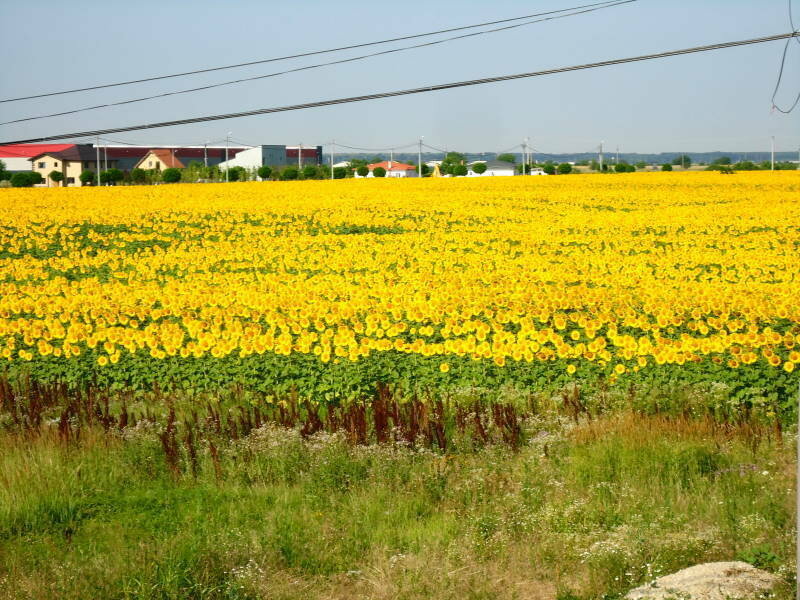 A field of sunflowers blooming is the most beautiful sight! Their yellow heads standing up, against the blue sky, is always such a treat. And since I now live in the countryside, I'm lucky to have this treat every summer. But the gardener in me had always wanted to see a sunflower grow from seed, blooming and making seeds in my garden. 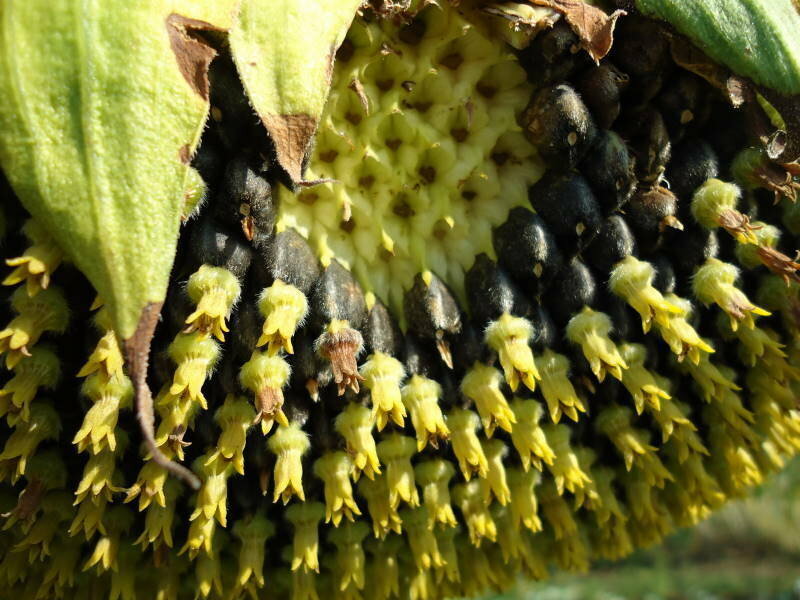 This was, at first, a wish come true, then I thought it would be good to have a few sunflower heads from which I could collect seeds for me and the birds, for all winter long. I have some sparrows nesting under my house roof and a few magpies coming over for food. Each month I buy a few pounds of sunflower seeds from the market. I roast some for me when I'm watching a movie, and feed the rest to birds. 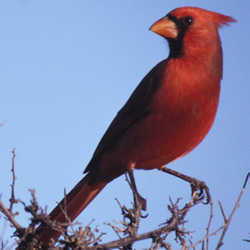 I fill their bird feeder with sunflower seeds every morning and watch them quarrel while they are eating the seeds. When we first moved into the countryside, I felt sorry for the little sparrows who were so thin and tiny, compaired to those living in the city - or so I thought. 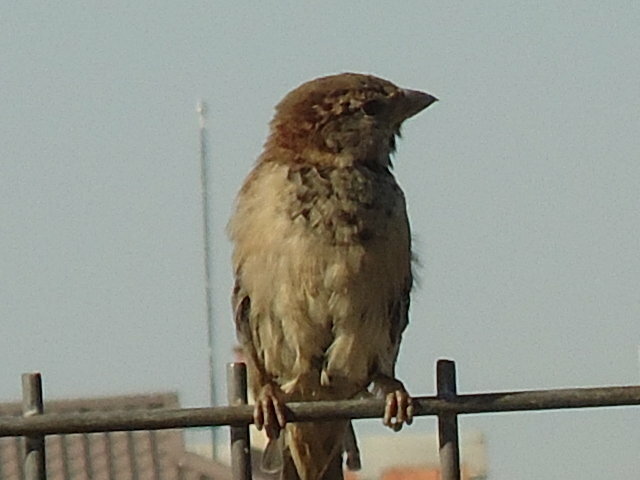 Now they are "the fattest sparrows in the country", as my daughter would say, although I'm reducing their ration during summer, when they have lots of bugs, worms and other seeds on the field to eat. Do you think they are leaving the sunflower seeds untouched in the bird feeder? No! One of them (maybe the oldest and the bravest!) is always waiting for me every morning, in front of the door, sitting on the fence and chirping anxiously, if I don't come out soon. 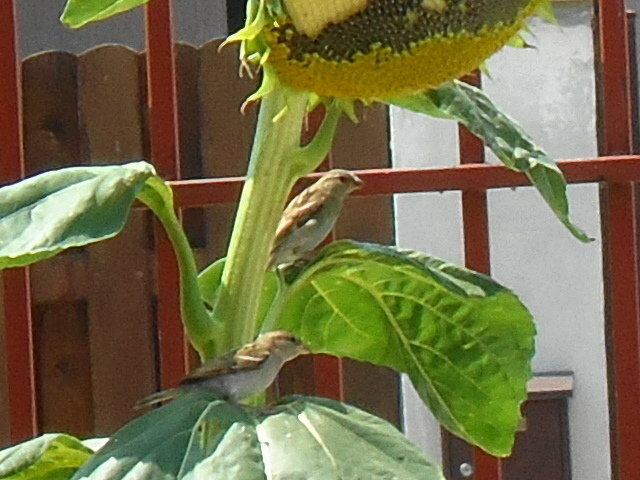 Which is why I thought that a nice sunflower crop would be perfect for both the birds' and my needs! "Home count doesn't fit the fair count", says an old Romanian saying; so was my plan with the sunflower seeds. First year I sowed a lot of seeds around my vegetable garden, which I thought would look beautiful when the sunflowers will be in full bloom. I watered them thoroughly and they grew very tall and strong, with large hats. I was happy to have such a great sunflower crop and I could almost see the seeds in large sacks in my paintry. However, the sunflowers proved to be more like brave guardians for my tomatoes, against the birds' attack, than my crop. 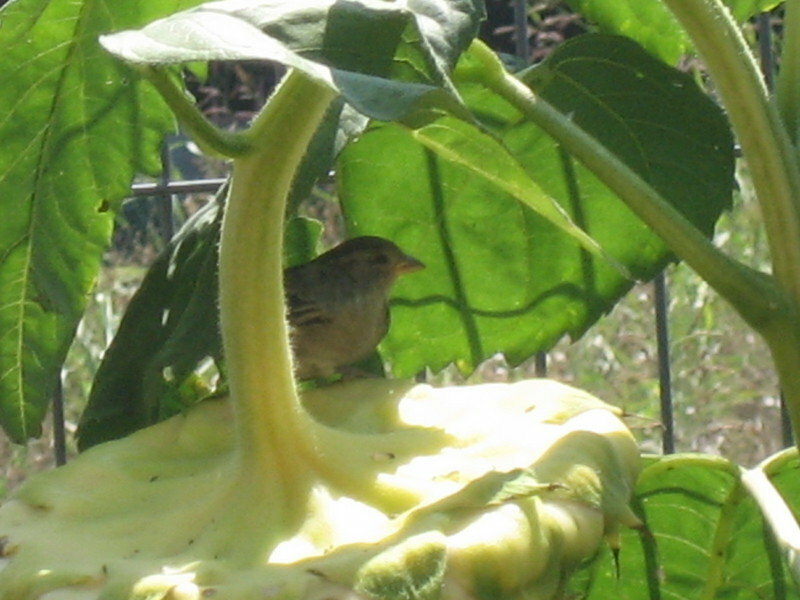 The birds, who at first were eating every ripe tomato in my garden, moved their "attack" towards the ripe sunflowers. They prefered the sunflower seeds to the ripe tomatoes, which saved part of my tomato crop. 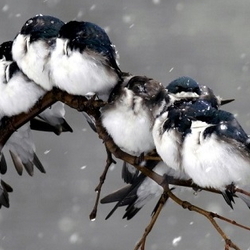 The birds are smart and know what's good for them. 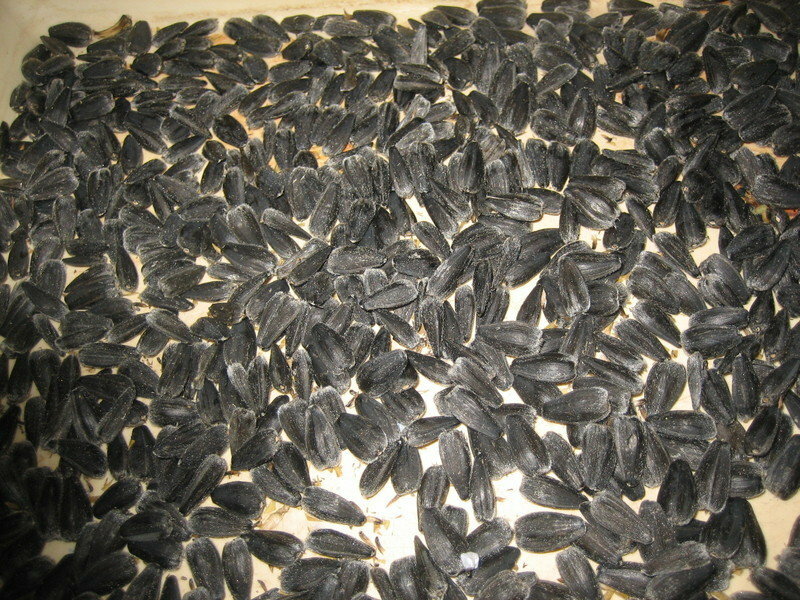 It seems that sunflower seeds have all the necessary nutrients for the birds. 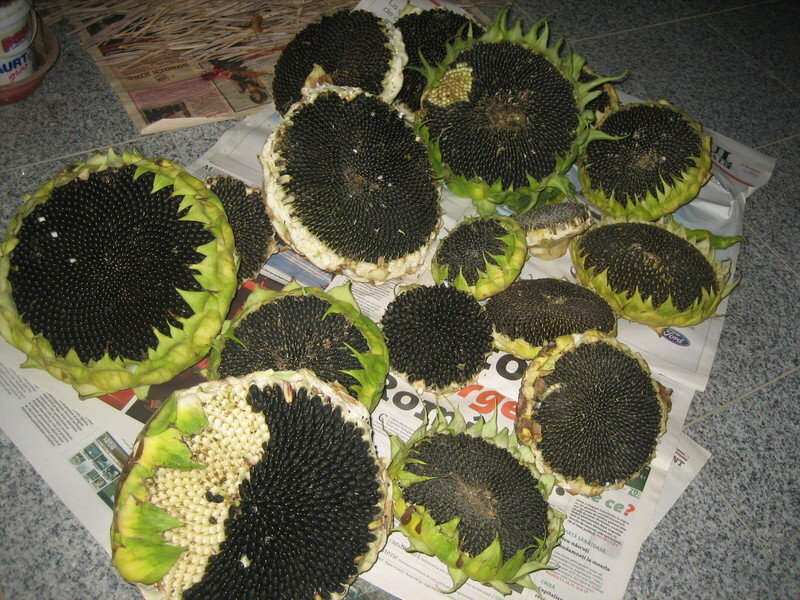 However, I managed to harvest a few full sunflower heads that summer, but I had to do that before they even had a chance to dry off, otherwise the birds would have eaten them all. I didn't mind sharing with the birds, but hey, let me get some seeds too! After letting them dry for a few days, I tried to hit the sunflower hats with a stick, just as I remembered doing it at my relative's house. The seeds wouldn't come out so easily because they should've been well dried. But I managed to get them out of the hats anyway and spread them on paper sheets to dry off. I had hoped I would have enough seeds for at least a month or two. No way! The hats were huge and seemed to have lots of seeds, but after scattering them out there weren't that many after all. Yet, they were organic seeds, from my garden, the fruit of my work, so we all ate them with great pleasure. The smaller seeds I fed to the birds and then I started buying from the market again. I was beginning to wonder what would be the use of growing sunflowers again in my garden, except for fun, for their beauty and for feeding the birds. I was resigned to the idea that my birds were my masters (read "spoiled brats"!) and they could have all the sunflower seeds from my garden - which weren't all that many, since I still needed to buy from the market. If I had a whole field of sunflowers, it would have been a whole different matter, but since I don't have enough, better to let the birds have them. They sow lots of sunflower seeds every summer, by scattering them everywhere in my garden. Sunflowers are popping out, here and there, especially around the bird feeder. It's only fair that my birds should have the right to feed on their seeds! I don't mind because I love them and I want them to be happy. To see the sunflowers blooming and the birds eating their seeds will always be a joy, for which I was willing to give up my rights on the sunflower seeds . But as much as a good, birds loving person I'd be, I don't like them pecking at my ripe tomatoes; not after working so hard to grow them. My husband blames me for pampering the birds too much and for interfering in nature's course, by feeding them sunflower seeds - of course, it's his frustration talking! This way I sort of adopted them and made them feel at home, so they feel like they can eat everything they want in my garden, like any other member of my family. I like this, but at some point they are just too invasive. They eat the few cherries my small cherry tree produces every year and the raspberries - as soon as they ripen; then some of the apricots and, later, they're all over my tomatoes. They don't damage too many, but I feel frustrated not being able to have the first ripe tomato from my garden because the birds have already started to eat it. How could I ever change this without harming the birds? My husband suggested we get rid of them by covering the holes under the roof, through where the sparrows are entering and building their nest. I couldn't agree to such a cruel decision, so I kept on searching for a more humane solution. And then it hit me : the sunflowers were the key! I told my husband to stay calm and don't worry because I now have a hidden agenda. I'm not just going to let the birds eat all the sunflowers in my garden for nothing. I've decided to make this compromise, sunflowers for tomatoes - they get the seeds, I get the tomatoes! I just need to be patient and sacrifice a few tomatoes, until the sunflowers ripen, then the birds will be lured away from my tomatoes, by their craving for the sunflowers seeds. Imagine they can eat about a large sunflower hat every day, which leads me to a new count, considering how many and how large the sunflowers in my garden should be. Luckily, they don't eat another tomato until they've finished the last one, so I just leave the tomato they've been pecking at on the plant. Anything to save my tomatoes, even if I have to be bad and have a hidden agenda. Don't tell the birds, they wouldn't care anyway! Funny thing, the birds don't seem to be interested in flying away and find new sources of food, although a field full of sunflowers is right accross the street. I'm wondering if they can still fly long distances, say, longer than my yard's fence? Adina is a Romanian plants and pets addicted, always happy to share her experience. Follow her on Google.